Paper size: 32 x 31-1/2"; image size: 20 x 20-1/2"
Published by Crown Point Press. Printed by Dena Schuckit. Anne Appleby is a monochrome painter who works from nature. This sounds contradictory: monochrome painters usually talk about the nature of paint, the flatness of surface, shallow space, the physicality of a painting on the wall. Appleby talks about the view from her house in Montana, or the colors in a plant as it grows and changes. She does not discount theoretical things, but her inspiration is elsewhere. "My paintings aren't about the other world," she has said. "They're about our place in this world. What nourishes the soul is the experience of being in the body." In thinking about the history of monochrome painting, Yves Klein has come into my mind. Klein, who made all-blue painting and died in 1962, is a hero of most of the young artists working this way today. He developed his own particular shade of blue (IKB-International Klein Blue) and applied it with a paint roller, so his paintings are physical in feeling. 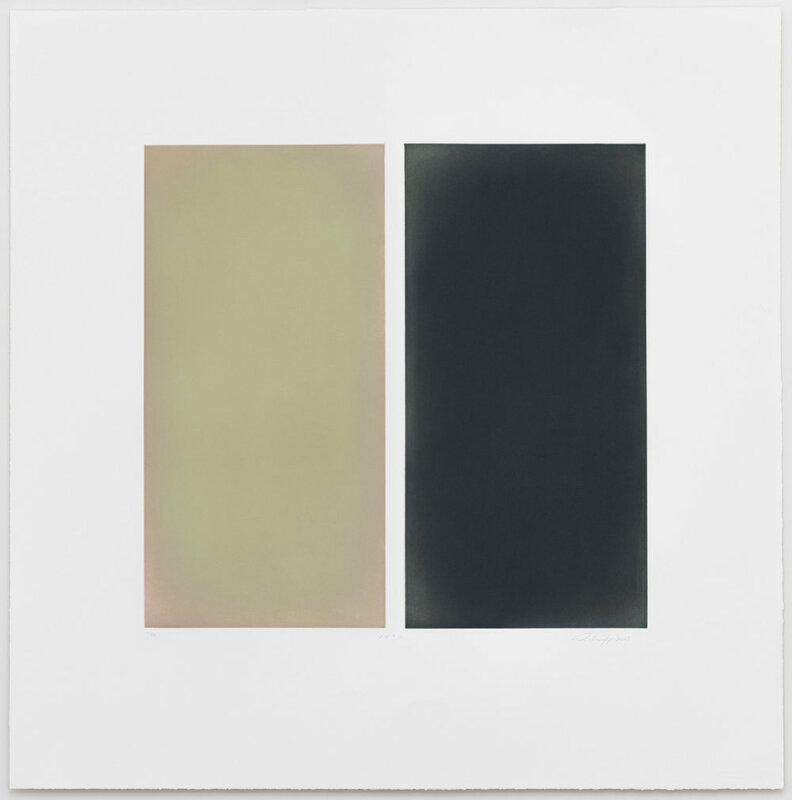 Appleby's painting is related to his in that Klein's IKB was not about color alone. He was painting something. He had subject matter. His subject was "The Void." That subject matter, of course, is outside the body and concerned with the "other world," so Appleby's subject is different. Nevertheless, she shares with him an illusionistic approach to the use of color. 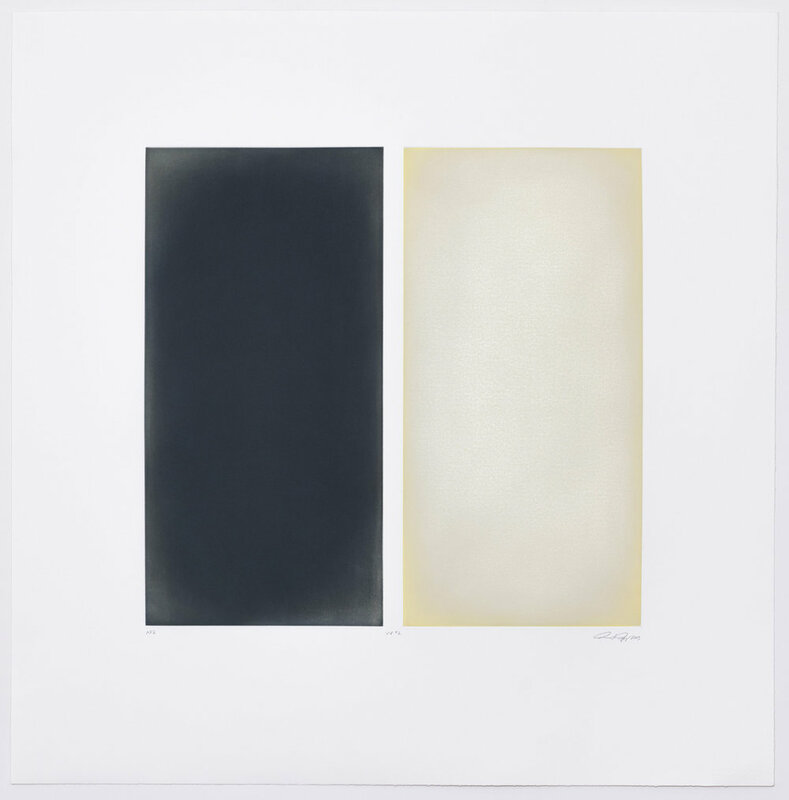 Appleby admires Klein and also several contemporary artists who work in monochrome; she often is invited to be in exhibitions in their company. Her work, nevertheless, is not truly monochrome. Our first impression is of a single color, but close inspection reveals that the single color is composed of many. Her surfaces are soft and, though she paints with brushes, the paintings do not have visible brushstrokes. In the same way, we do not find immediately visible handwork in her prints. The handwork is there, however, and highly crafted. The prints are aquatints, printed in layers of subtly varying colors from places that Appleby has polished to wear down the amount of ink-holding tooth in certain areas, particularly the edges. Aquatint is essentially a transparent medium , and Appleby has used this characteristic without transmitting a watercolor feel to the finished work. She has managed to create a denseness in the inked surface while retaining transparency, so the prints have a strong physicality along with their glowing delicacy of their colors. Presented here is a very large aquatint project by Anne Appleby: 16 prints named after the Northern Italian town of Verona, where the art collection of Count Panza di Biumo is partly located. In 2002, Count Panza commissioned Appleby to make a site-specific painting installation to fill a room in the Gran Guardia, a former armory in the center of Verona that now houses pare of Panza's collection. It is an upstairs room with 30-foot-high ceilings, three doors and a set of windows. Appleby thought of the work in the room as one painting, which she created in six 12 x 6-foot panels. She cook as her subject matter the poplar trees in the Adige River Valley of the Veneto district of Italy, where Verona nestles on the river's banks. "I have always loved the cottonwood and the aspen, which are the poplars of the American West," Appleby says. "I am very passionate about these trees, and have painted them often. They are among the few deciduous trees in Montana, so there are dramatic changes in them in every season." "One panel is the green leaf of the poplar," Appleby says of the six panels she created for the Gran Guardia. "Another is the rusty color of the catkin or seed-pod, and the remaining four panels are the colors of the bark at various stages of maturity." Panza asked Appleby if the paintings could also be presented as diptychs, perhaps at a future time, and wondered if particular pairs should be hung together. On consideration of this, Appleby decided that any panel of the six should be able to go with any other. This is how the idea for the Verona Variations came about. Crown Point's invitation to Appleby to do a new set of prints came at about the same time as her invitation from Count Panza to do the paintings for the Gran Guardia in Verona. "I was thrilled with both invitations," Appleby wrote in a note to Valerie Wade at Crown Point. "I worked on chem simultaneously, both conceptually and physically. I started by making small paintings on paper to scale with the Verona project. I brought the little paintings with me to Crown Point and arranged chem on the studio wall. That was the way the Verona Suite was started." The small single etching tided Verona Suite presents the six panels as installed in the Gran Guardia. 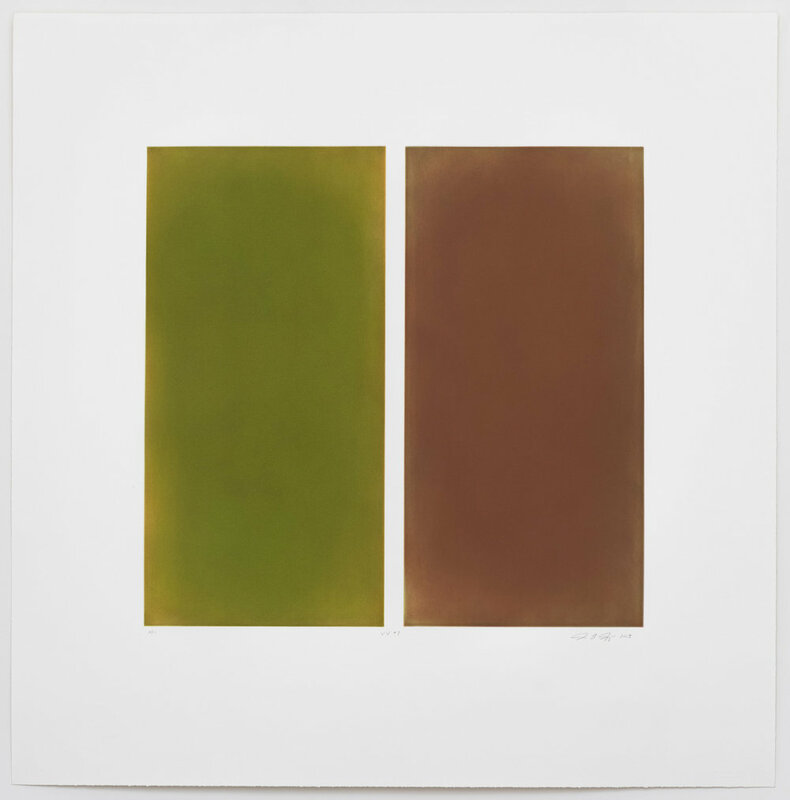 Each panel is made up of four plates, each inked with a subtly different color, printed one over the ocher. Each of the resulting colors appears again on a larger panel (printed from five plates), and in the Verona Variations the six large panels are printed in all their possible combinations to make a series of 15 prints that are portraits of the poplar in its various life-stages.